I couldn’t resist quoting Bill Withers in my headline because this serum is honestly as close as you’re going to get to sunshine in a bottle (hence there being no sunshine when it’s gone). Did you know that more than a billion people worldwide are Vitamin D deficient and that number grows in the winter? 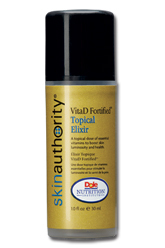 Obviously this staggering number caught my attention when Skin Authority sent me a bottle of their Vita D Fortified Elixir ($59). I personally don’t think I’m Vitamin D deficient since I live in sunny California, but the promised brightening effects is what got to me incorporate this serum into my daily regimen. Skin Authority Giveaway: We Have An Adorable Winner!! Congratulations to Julianne Vanderbaan from Ontario, Canada for winning the Skin Authority Sensitive Skin Kit (worth $322)! Could she be any cuter?? Julianne, you are going to love these products, BUT… Judging your age by your photo, my advice is to hand over the Super C Serum and Vitamin A Skin Renewal to Mom who will love you forever for it! In addition to regular using their Sensitive Skin Kit (Julianne, I’m an old lady so I can handle the anti-agers), I actually just slathered on some Skin Authority Calming Cream on the areas where I butchered my face via evil blackhead extractions (yes, I know I shouldn’t be picking at my skin…) which took down the redness and irritation immediately! A HUGE thank you to Skin Authority for generously providing the Skin Authority Sensitive Skin Kit for this giveaway!! Gorgeous Giveaway: Skin Authority Sensitive Skin Kit! The only thing better than amazing skincare is FREE amazing skincare!! As promised in my post earlier today, thanks to the lovelies at Skin Authority, I am able to giveaway a Sensitive Skin Kit (worth $322.00) to one of my lucky readers! – Daily Cleanser, 6.0 oz – Antibacterial gel removes dirt, oil, and cell build-up while normalizing pH, leaving skin feeling clean, smooth, and ready for treatment. – Super-C Serum, 1.0 oz – Body’s natural form of Vitamin C fortified by antioxidants for maximum absorption and to increase firmness and tone while protecting against irritation and redness caused by sun exposure. – Vitamin A Cell Renewal, 1.7 oz – Non-irritating Retinyl Palimitate cream formula unclogs pores and stimulates turnover to smooth skin and prevent breakouts without irritation or side-effects. – Ultra Rich Moisturizer, 1.0 oz – The “Earl Grey Tea” of skin care, calms, soothes, and restores skin’s moisture balance and evens out skin tone by reducing inflammation and redness. – Sunscreen Moisturizer SPF 30 UVA 4-Stars, 4.0 oz – Lightweight, dual action formula moisturizes and protects against UV damage. I may have gotten a little nervous when I first read about Skin Authority products since I saw “RESULTS“ and “POWERFUL“ on almost every page. Obviously there are plenty of people out there whose skin can handle powerful results-driven products, but as my readers know my skin is a high-maintanence, moody, whiny little drama queen. Sure, I would love to be able to erase those lines on my forehead and close those gaping pores, (Yes I’m being dramatic; I’m in a mood after 45 minutes of scrutinizing at my skin in a startlingly strong magnified mirror) but noooo my skin would simply have a tantrum. So, you can imagine I was afraid that the Skin Authority products wouldn’t be gentle enough to treat my bitchy skin. Au Contraire!! I’m not the only lucky one in this scenario — thanks to the nice people at Skin Authority, you have the opportunity to win $322.00 worth of free skincare, targeted at sensitive skin! Make sure you check back later today to enter! !